Tens of thousands of residents from across Renfrewshire got into the Commonwealth spirit when the Queen’s Baton Relay arrived in the area for a sensational day of sport, scorching sunshine and spectacle. Huge crowds turned out in towns and villages and enjoyed fantastic weather and a tremendous atmosphere as every one of Renfrewshire’s 15 towns and villages got the chance to join the fun. The baton – the symbol of the Glasgow 2014 Games – was passing through Renfrewshire on Day 34 of a 40-day tour of Scotland before the main event starts next week. Along the way, Renfrewshire Council had laid on a series of events for locals in each of the main towns, lending a festival feel to the occasion. 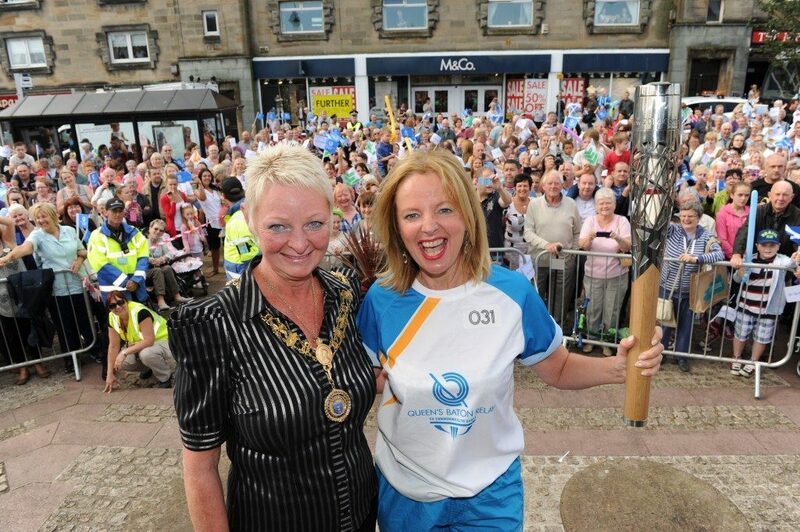 The day started in Howwood at 8am, before a crowd of more than 1,000 saw actress and singer Clare Grogan carry the baton into Johnstone’s Houstoun Square later that morning. In the afternoon, the baton covoy was mobbed as it greeted the crowd at Erskine’s Park Mains High, before around 5,000 people packed into the streets around Renfrew Town Hall as the baton was given a rock-star welcome. Paisley was the last leg of the journey, with stops in Gallowhill and Ralston before the baton was carried into a packed Abbey Close ahead of a spectacular finale performance by the Commonwealth Youth Circus. The baton was carried by around 150 batonbearers, most of them residents specially selected in honour of their community work, with wellwishers from around the area lining the route to cheer them on. Other high-profile batonbearers included broadcaster Shereen Nanjiani, who carried the baton into Erskine Hospital at lunchtime, while Olympic swimmer and Scottish Commonwealth gold medallist Gregor Tait was the athlete given the honour of the final leg into Paisley’s Lagoon Leisure Centre. Renfrewshire’s Provost Anne Hall was out and about at many of the events during the day. She said: “This was a very special day for Renfrewshire. People really took the event to their hearts and played their part in what was a very exciting spectacle. “The baton has made an epic journey around the globe, meaning today was a chance to write our own chapter in that long-running story – and Renfrewshire didn’t disappoint. “The route allowed us to show the world everything that makes the area great – from rolling countryside to historic town centres to modern schools and leisure facilities. “But above all we have a great sense of community – never better displayed than by our batonbearers, and by the people who lined the streets to cheer them on. “I would like to thank everybody who came out and made this such a fantastic day. Many of the events on the day took place in partnership with the Games for Scotland programme, managed by EventScotland, which forms a key part of Legacy 2014 – the Scottish Government’s commitment to deliver a lasting legacy as a result of the Commonwealth Games coming to Scotland. The Games for Scotland programme of events are an opportunity for people to celebrate the arrival of the QBR to their local community while continuing to build on the Games legacy, whether that be through taking part in a cultural event, working together to celebrate the Games, or being inspired to become more active.